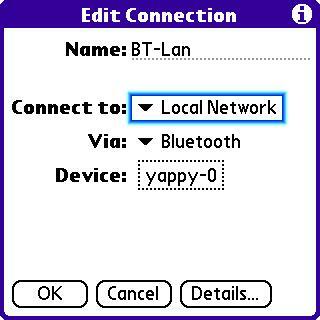 Using a Linux server as a Bluetooth Network access point. One astute blog reader noticed I use my Linux server for Internet access, and wrote to ask me how I did it. I’d set it up a couple of years ago to work with my Tungsten T, and I only had a minor hiccup when I tried to switch to the Treo (I can’t remember if I had the same problem with the Tungsten T, but I think so); more on that later. The hiccup I had with the Treo involved pairing it to the Bluetooth dongle on the server. 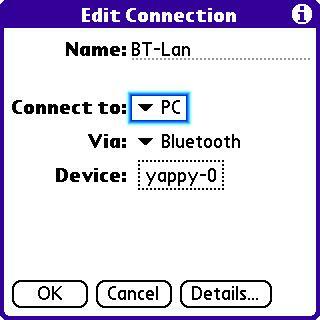 In the network preferences for the BTLan connection I made, I had to pair it using “Connect to PC”, and then after it was paired, I had to change the setting to “Connect to LAN”. It wouldn’t pair if it was set to LAN the first time around; it may be because the Dongle isn’t advertising network access as an available service. I haven’t bothered to look into it further, as it works fine once paired as a PC. As a SOHO network access point for a single user, it works pretty well. According to the speed reports at text.dslreports.com, the Treo’s Blazer web browser averages between 125-150 kbps. I can pick up my e-mail just fine, and local access to my fileserver over ssh (secure shell) runs great as well. More data intensive stuff like file transfers or VNC (kind of like remote desktop) are about the same speed, which is slower than Wi-Fi or a wired network, but still very usable. The trade off is speed for convenience and no cellular data fees; with Bluetooth dongles available in the $25 range, it does make for inexpensive wireless access at home.